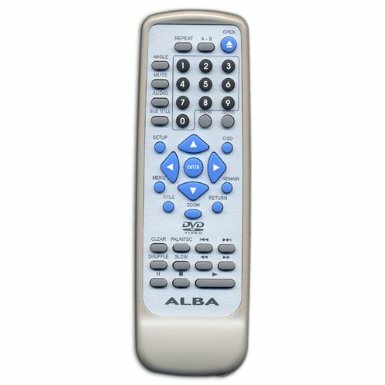 Interested in the ALBA DVD165B original remote control? It's the exact version which came with your system, and doesn't need to be programmed. Created by Alba to use with the DVD165B product. Arrives with all system-specific options. Same width and height. Taken from stock swiftly and sent by FREE 1st class post. There's also a one year fault or defect replace promise and an any-reason refund policy of thirty days. Grab your ALBA DVD165B remote control now. Why buy this ALBA DVD165B Remote Control Original? This remote is a like-for-like replacement of the branded original, and one of the many hundreds of thousands of original remotes we've sold across the UK since 2006! Unlike some cheaper replicas out there (usually too cheap to be true), we only sell this genuine remote control for the DVD165B direct from the manufacturer with a 1 year warranty. This remote comes with same/next-day dispatch and FREE 1st class UK delivery. Arrival in 1-2 working days, with many orders arriving the next working day. All remote controls come with a 30 day return period for your peace of mind. You'll also receive a full 1 year warranty. If you need any advice about the right model to choose, or have any questions, please call 01302 361444 (Mon-Fri 9am-5pm) or send us an e-mail and we'll be happy to help. Debit/credit card - Pay online via our Sage Pay secure payment gateway. Phone - Call us with your order number to pay by phone (Mon-Fri 9am - 5pm).